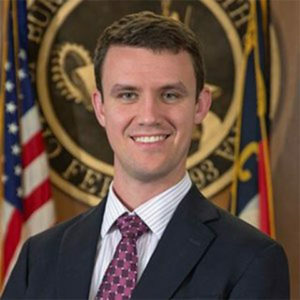 Mayor Ian Baltutis, elected in 2015, is a 2008 Business Entrepreneurship graduate of Elon University. He has worked for businesses both large and small in roles that ranged from customer service to technology support to logistics and management. He also managed purchasing, logistics, and ERP system integration for Honda Power Equipment Mfg from 2007-2011. Currently, he owns and manages Vibration Solution LLC, an American product design and manufacturing company that he founded during his studies at Elon. Baltutis is a strong supporter of American manufacturing. He founded his company around the idea of turning the standard business model upside down and creating a company that is lean, efficient and nimble. His foresight and leadership have allowed the company to reach and profit from hundreds of niche markets that other companies cannot serve.